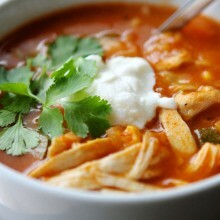 Made with a ton of veggies and chicken this Chicken Tortilla Soup is healthy, filling, easy to make and downright delicious. Give it a try! Place a large pot over medium heat. Sauté onion, garlic, carrot, zucchini, and corn in olive oil to soften slightly 5 minutes. Stir in beans, tomato sauce, spices, chicken stock and bring to boil. Reduce to simmer and place whole chicken breasts into soup. Cover and simmer 10-15 minutes or until chicken is cooked completely. Remove from pot, shred and return to soup. Stir in tortilla strips and cook another 10 minutes. Ladle into bowls and serve with any desired toppings.